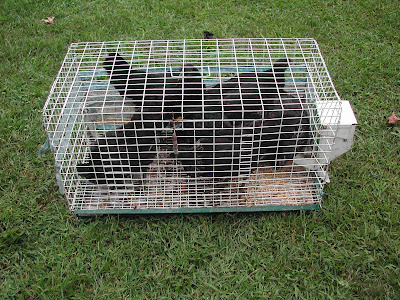 Doe Run Farm got 7 new Iowa Blue chickens this weekend. They are a little hard to see in their cage, but they arrived in fine spirits and are settling in nicely. New Iowa Blues, huh...Too bad I can't visit soon and get new friends like Goldie & Lorelei. awesome photo, these chickens look so delicious!